I really wanted to hit these two over the head, but yes yes I totally get it, still one should think they would understand that the other person liked them back. Alas no. Abby ran away 10 years ago (and I totally get why). Now she is back to give him a second chance. And she is confident (at times), stronger and her own woman. Graeme spent the last 10 years alone, and not that he cared. He never wanted a wife in the first place. Ok so yes their marriage started on such bad terms. He likes someone else. Her father blackmailed him and orchestrated the whole thing. Can you blame either of them? And he is certainly no perfect gentleman! Shame on your Sir! They have a lot work through. There is distrust on both sides and even when they enjoy spending time together they have second thoughts. Idiots! You clearly enjoy it! But that is not all! There is danger and secrets to unravel too. I did guess it in the end, yes! I got one thing right for once. His range was not the best. Of course I could still enjoy it, but I wished he had not forgotten her accent. "Shame on you sir!" *giggles* They sound like they have quite a bit to work out! Danger and drama can be fun and I do love the cover. You made me laugh when you said you wished he hadn't forgotten her accent. You'd think at least he could remember! Congrats on making out one secret before it was revealed. Another good historical. Characters you want to hit over the head, that would drive me nuts. 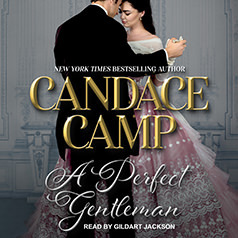 I haven't read Candace Camp before. 10 years apart is a very long time. I will say that I do feel like I read it differently as a child than as an adult. Different things stick with me at the end, and new things will pop out at me when I'm reading. I love that the books seem to grow with me. Lol, yes, but I guess it is fun, but sometimes I just get so OMG people! get a clue! You read it?! Awww, I am gonna get book 2, since I liked his cousin and Laura. whaaat? It sounds like these two will drive me up the wall. I have a hard time with historicals on audio. They always seem to move too slow for me. I read a book similar to this. I wonder if it was common back in the day for this type of marriage to happen? Old British families marrying rich Americans? Huh. I have watched documentaries about it, The Brits were poor with big houses, Americans wanted a title, boom!